The new imageCLASS D1370 will help your small or medium business stay ahead of the curve. This reliable machine combines all of your needs into one easy-to-use compact design, making it a cost effective choice for your business. The D1370 offers you multiple ways to maintain a productive environment throughout the work day. It features a 500-sheet cassette plus 50-sheet multipurpose tray and has print and copy speeds of up to 35 pages-per-minute. With Quick First Print Technology, your first copy will be ready in approximately 8 seconds. The 50-sheet Duplex Automatic Document Feeder (DADF) will allow you to copy or color scan from one or two-sided originals and produce two-sided output effortlessly, reducing your paper usage to as much as half. The D1370 is a step up from its sister model the D1350 as it provides Canon's Send Lite feature which allows you to scan digital document information and send it to e-mail addresses and network folders. It also adds the secure print feature which can be an excellent solution for professionals in the medical field as well as law firms. You can feel free to print confidential information and not have to be concerned that another person will take it off of the printer. The imageCLASS D1370 gives you the ability to send and receive faxes using the built-in 33.6 Kbps Super G34 fax modem. 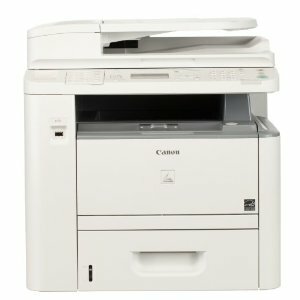 This model has a strong list of fax features, including 19 one-touch speed dial numbers, 181 coded speed dial numbers, memory capacity of up to 512 sheets5, and duplex faxing. The imageCLASS D1370 also incorporates the Canon Single Cartridge System, which combines the toner and drum in one unit making it easy to replace. The result is outstanding image quality and eliminating the complication and warehousing of separate toner and drum consumables.